Charleston Champions vs. Chiswick Chartbusters (Part One). Two compilation CDs, inadvertently played back to back, struck me as more than vaguely similar. One was of music from the 1920s, the other the 1970s, and each reflected a time when popular music was in a state of flux, courtesy of jazz and punk rock. 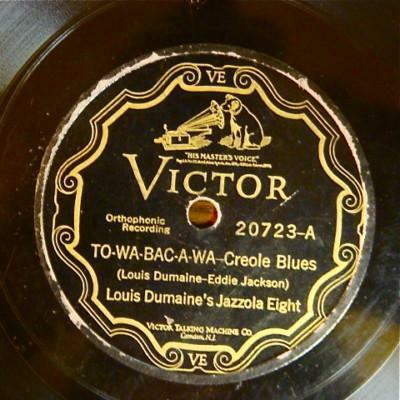 Both of these genres, of course, were frantically energetic by the measure of their day, and both were composites of other music of similar spirit – blues, ragtime and Vaudeville were just three of the many ingredients of early jazz, while rock ‘n’ roll, pub rock, glam rock and even Music Hall had their place in punk’s gumbo. The CDs in question – “Jazz the World Forgot” and “The Story of Chiswick Records” – offer a fabulous selection of old waxings, and give a wholly unvarnished account of their times. But they also share a striking similarity in the stories behind many of the songs, the background details that delight the musical stamp collectors out there. A lot of these acts were obscure, many of them were frankly peculiar and there was hardly one of them that you’d take home to meet your family, but you’d be hard pushed to view any of them without affection. Here, then, for your delight, delectation and perhaps even sepia-tinged recollection, ten records of different stripe, all cut from the same cloth. And in the time-honoured tradition of the compilation album, there’ll be a Part Two any time now! (Note to younger readers/anybody under 50: Chiswick Records was an independent record label set up by Roger Armstrong and Ted Carroll in London in 1975. It grew out of Rock On, a Soho market stall that specialised in vital and vibrant music, be it rock’n’roll, soul, rhythm and blues, whatever. It inevitably embraced punk in due course, although it stuck to its original template of releasing hard-edged records for music lovers – colourful, energetic, good-humoured, characterful and occasionally preposterous. What more could a young man ask for? It morphed into the fantastic reissue label, Ace Records, in 1983). 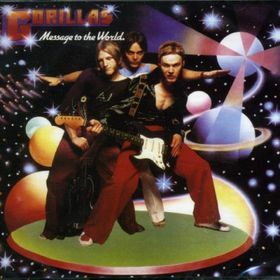 The Radiators From Space embodying the glamour of the 1970s. 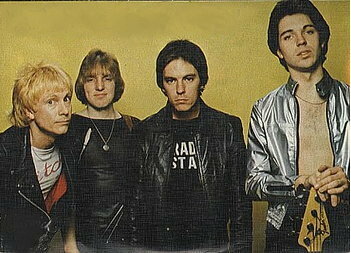 Radiators from Space were one of the first punk rock bands, and Roger Armstrong from Chiswick records was encouraged by a member of Horslips, surprisingly enough, to go and check them out in Dublin. While he was there he recorded this, the band’s debut single, in a local studio clearly too funky for such fripperies as a metronome. He followed its success by recording their first album in the same manner, thus capturing an important slice of the music’s regional history. In Louis Dumaine’s day (March 7th, 1927 on this occasion), it was not unknown for music companies to set out with mobile equipment to record the further-flung musicians, preserving great swathes of jazz, blues and country and a whole kaleidoscope of their regional hybrids: this obscure but quite joyful gathering of marching band veterans was captured in New Orleans by engineers from the Victor Recording Company, in the back store room of a music shop on Canal Street! Jesse Hector (right) had a very clear idea of what he wanted from his music, but a much less clear idea of what he wanted from a hairdresser. Thomas Morris, sans red coat. The Hammersmith Gorillas were fronted by the self-assured Jesse Hector, a man with a very clear idea of what he wanted from rock ‘n’ roll. Jesse already had over a decade’s experience in music, and had led a number of his own high-octane bands, among them the unforgettable Crushed Butler. His music was direct and exciting enough to earn his band great affection in the vibrant musical environment of 1976/77, dated as it may have seemed as post-punk music took its various paths. Jesse remains active on the more self-contained fringes of rock and roll, and at the time of writing was working as a cleaner at the Royal Horticultural Society. 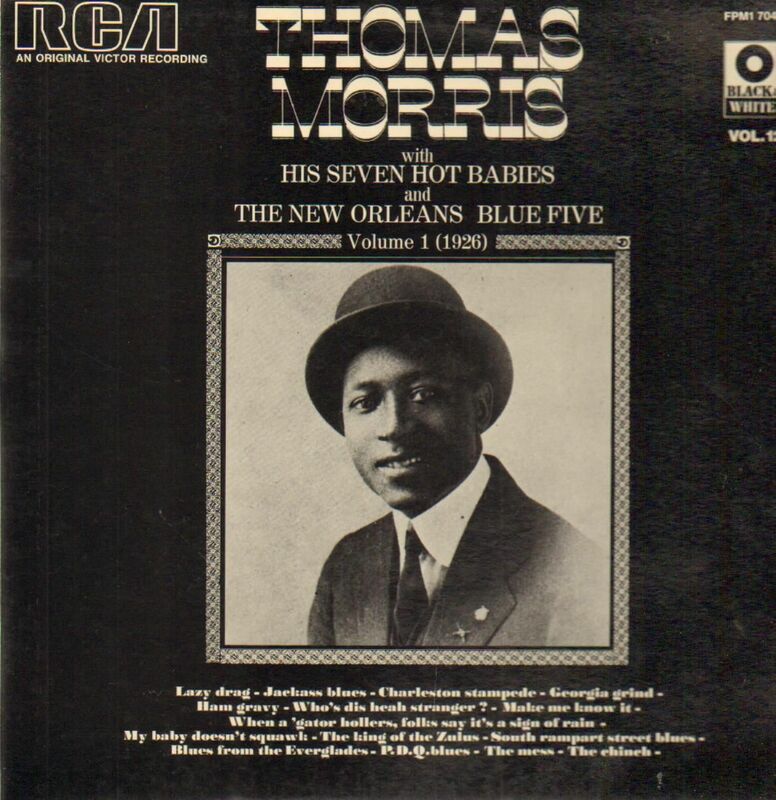 Thomas Morris, a cornet player similarly known for reliability over innovation, was extensively recorded during the mid-20s, but became less fashionable following the rise of Louis Armstrong. Morris carried on undaunted until the early 30s, after which he spent a couple of years as a Redcoat in Grand Central Station before joining a Christian fundamentalist group and changing his name to Brother Pierre. You couldn’t make it up! Radio Stars. Well, John Peel and Kid Jensen liked them. The Apollo Syncopators were the house band in Chicago’s Apollo Theatre in 1926, and as such had a repertoire to suit all occasions, from Vaudeville accompaniments to full-on jazz stompers. 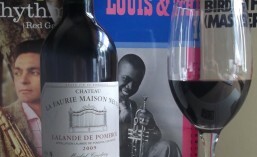 The leaders, violinist Leroy Pickett and pianist Tiny Parham, had extensive experience backing blues singers on records, (Parham even cutting a few with the legendary Johnny Dodds), and this recording of the theatre band blends the energetic exuberance of jazz with such stagey details as a wood block solo and a clownish trombone break, all following a cheesily dramatic introduction. Radio Stars had a singer, Andy Ellison, who had been in John’s Children with Marc Bolan in the 60s, and a bass player/songwriter, Martin Gordon, who had been a member of Sparks (don’t say you can’t imagine Russell Mael singing this!) They formed the Stars in 1977, and while they were associated with the punk movement, they bore their wit, pedigree, tunefulness and offbeat humour with a swagger that set them well apart. “Dirty Pictures” begins and ends with corny guitar histrionics, and in between relates the misadventures of an amateur pornographer, by way of amusingly toe-curling rhymes and a breezily timeless power-pop structure. Perfect! Lock up your daughters, it’s Johnny Moped! The jazz devil that was George McClennon. Lennon/McCartney. Bacharach/David. Ellington/Strayhorn. Berk/Berk/Moped/Toad…Sometimes you don’t need to actually play a record, you can just gaze dreamily at the evocative songwriting credits and let them take you to a magical world. Johnny Moped was an early punk band whose initial line-up featured Chrissie Hynde and the odd member of the Damned, before settling into the classic, DHSS-dodging, non-baptismal roll call of Fred Berk, Dave Berk, Slimy Toad and Johnny Moped himself. Never a band to take themselves too seriously, their shows often bordered on the Vaudevillian – guitarist Toad was given to playing from the top of the PA, dressed only in shorts and wearing a sieve on his head, front man Moped was wont to precede songs with lengthy musings on mediaeval weaponry and on one famous occasion, the group ganged up on their singer and painted him green. George McClennon didn’t just border, he was a fully-fledged Vaudevillian, who, like his adoptive father before him, was a passable comedian who played on the “black-in-blackface” schtick. He was also a clarinettist in the novelty “gas pipe” tradition of the day, (any number of animal sounds and assorted funny noises, all present and correct here) and he would often play while performing acrobatics. Nonetheless, the records still sound quite thrilling, especially the uncredited cornet work on the tune featured here. The fate of the teenage Spinners fan. 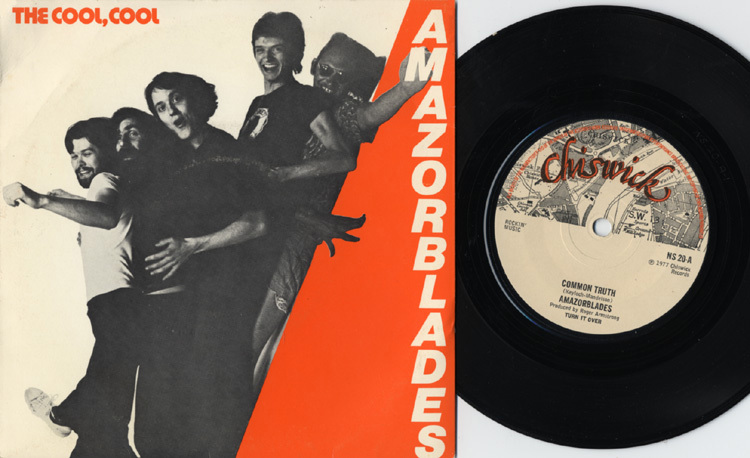 Amazorblades, based in Brighton, released this one appealing pop-punk single – tuneful, but with none of the fury of the day -though their individual musical roots lay elsewhere. 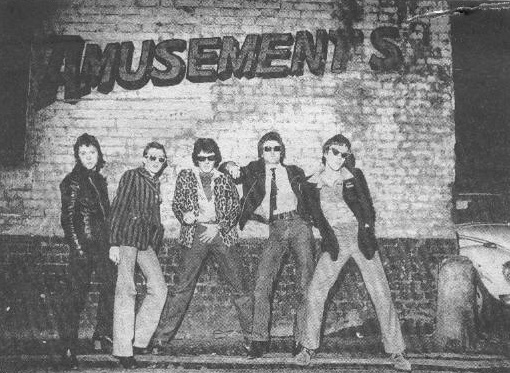 One of their number, the late Steve Harris, had played with prog-rock band Woody Kern in the late 60s, while another, Ben Mandelson, had been active on the Liverpool folk scene in his teens and was a fan of the Spinners. Perhaps realising that none of this was very Punk Rock, the ‘Blades split up and the members moved in more interesting directions: Ray “Chopper” Cooper joined the Oyster Band, Mandelson joined world-music pioneers 3 Mustaphas 3 before becoming a well-renowned producer, and Harris formed an improvising jazz ensemble called Zaum, enjoying great artistic success (i.e. he still wasn’t going to give up the day job). 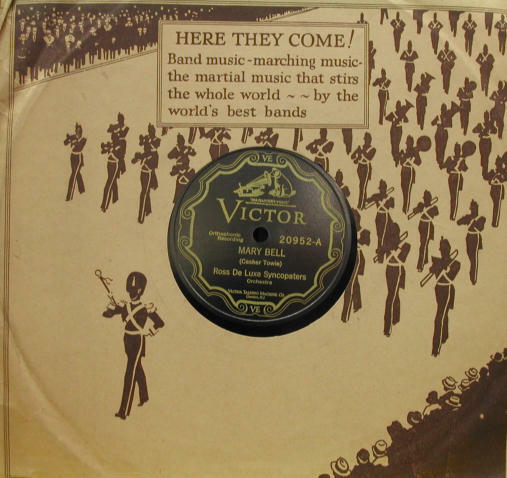 The Deluxe Syncopators also hailed from beside the seaside, Miami in their case, and cut eight sides in one afternoon as part of a field recording in August 1927. 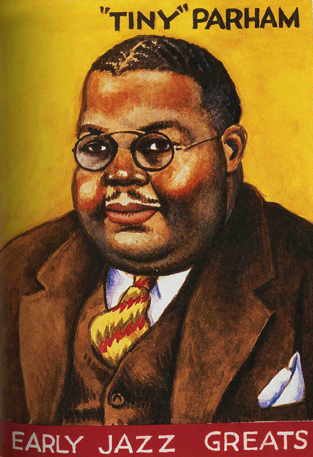 All of these plumped for old-fashioned melody over the rhythmic drive more common to their time, and twelve months after recording them, the band split up and its members took themselves to more fertile pastures: Edmund Hall became a clarinet giant in his own right, Cootie Williams became a pillar of the Ellington band and Robert Cloud, who wrote most of the tunes, went on to record with “King” Benny Nawahi, the Hawaiian steel guitar maestro.